Breeding Range: British Columbia east to Nova Scotia, south to California, Kansas, s. Illinois, and w. Virginia (Jones and Cornely 2002). Breeding Habitat: Dry Sand Prairie, Dry-mesic Prairie, Grassland-shrub, Idle Cool-season Grasses, Idle Warm-season Grasses, Pine Barrens, Fallow Fields, Small Grains. Nest: Ground, usually in a small hollow and well-concealed. Foraging: Ground glean, foliage glean, hovers. Habitat use during Migration: Open areas, roadsides, hedgerows. Departure Dates: September to October. Winter Range: Southern U.S. and Mexico. Winter Habitat: Grasslands, brush lands, forest openings. Vesper Sparrows prefer dry, open habitats with short, sparse vegetation, some bare ground, and short to moderate shrub or tall forb cover (Jones and Cornely 2002). Vesper Sparrows avoid wet areas with tall dense vegetation (Dechant et al 2001). In Wisconsin this species occurs in row crops, fallow fields, dry sand prairie, barrens, cutover or burned over areas, and young conifer plantations. Other suitable areas include dry-mesic prairie, short to medium height idle grasslands, Grassland-shrub, dry old fields, pastures, hay fields, small grains, weedy fence lines and roadsides, orchards, woodland edge, and shelterbelts (Sample and Mossman 1997, Dechant et al 2001, Jones and Cornely 2002). Fences, shrubs, or tall weeds are preferred song perches (Jones and Cornely 2002). In southwest Wisconsin, Vesper Sparrows were generally more abundant in lightly/continuously grazed, ungrazed, or rotationally grazed pastures than in heavily grazed pastures (Temple et al. 1999). Vesper Sparrows affinity for shorter, sparse vegetation makes them tolerant of shorter burn rotations. Several studies have shown high Vesper Sparrow abundance in areas one-year postburn (Krueger 1981, Herkert 1994, Vickery et al. 1999). Wisconsin’s barrens and prairie habitats are becoming uncommon, fragmented, and are vulnerable to conversion, development, and forest succession. Dry old fields, fallow fields, and small grains are more common within the state, but are also vulnerable to row crop conversion and development. Although Vesper Sparrows nest in row crops, most nests are lost to predation or mechanical field operations (Rodenhouse and Best 1983). Vesper Sparrows are common throughout southern and central Wisconsin, excluding the shorelines of Lake Michigan and the Mississippi and St. Croix rivers (Robbins 1991). 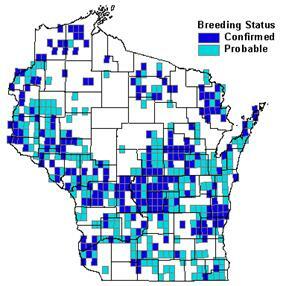 During the six-year period (1995-2000) of the Wisconsin Breeding Bird Atlas, observers confirmed breeding on nearly 20% of the surveyed quads (Schultz 2006). Although this species is widespread in the state, Breeding Bird Survey data suggest a range-wide decline since the 1960s (Sauer et al. 2005). There is little information on the possible cause(s). The most likely cause appears to be the loss of grassland habitats to forest, agriculture, and urbanization. Other factors may include pesticide use in agricultural fields (Jones and Cornely 2002) and earlier hay cutting. However, Vesper Sparrows are early nesters and nests lost to hay cutting may be second nest attempts (Robbins 1991). In prairies and other grasslands, Vesper Sparrows colonize new areas swiftly when habitat becomes suitable (Jones and Cornely 2002). Management activities such as mowing, grazing, and burning can create favorable nesting conditions for this species (Dechant et al. 2000). However, management activities should be performed outside the breeding season whenever possible to prevent nest loss. Conservation and management strategies for this species should be focused in the following Wisconsin ecological landscapes: Central Sand Plains, Northeast Sands, Northwest Sands, Southeast Glacial Plains, Southwest Savanna, and Western Coulee and Ridges (WDNR 2005). Within these landscapes, public lands important for the management of this species include Namekagon/Douglas County Barrens, Crex Meadows/Fish Lake Complex, and Necedah Barrens (David Sample, pers. comm.). Since Vesper Sparrows nest in cropland and small grains, there are a number of things farmers can do to reduce nest loss and still maintain their crops. Reducing the number of passes tractors make through crop fields or increasing the time interval between passes will increase reproductive success in row crops. Passes greater than 3.5 weeks apart will allow time for Vesper Sparrows to complete their nesting cycle before the next tractor pass (Sample and Mossman 1997). No-tillage practices and an increase in crop residue will also increase nesting success and foraging opportunities (Dechant et al. 2000). Maintaining fencerows adjacent to cropland as well as increasing the proportion of fencerows that consist of both herbaceous and shrubby vegetation will likely benefit this species (Rodenhouse and Best 1983). 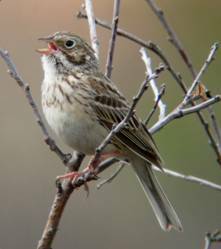 Causes and limiting factors for the Vesper Sparrow population declines need to be identified. More research is needed on habitat requirements of this species. Studies of nesting success under alternate management regimes in grassland habitats are needed, as well as long-term effects of nesting in agricultural fields (Jones and Cornely 2002). Knutson, M.G., G. Butcher, J. Fitzgerald, and J. Shieldcastle. 2001. Partners in Flight Bird Conservation Plan for The Upper Great Lakes Plain (Physiographic Area 16). USGS Upper Midwest Environmental Sciences Center in cooperation with Partners in Flight. La Crosse, WI. Temple S.A., J.R. Cary, and R. Rolley. 1997. Wisconsin Birds; A Seasonal and Geographical Guide. Wisconsin Society of Ornithology and Wisconsin Department of Natural Resources, Madison, WI. David Sample, Grassland Community Ecologist, Wisconsin DNR - 608-221-6351. Dechant, J.A., M.F. Dinkins, D.H. Johnson, L.D. Igl, C.M. Goldade, and B.R. Euliss. 2001. Effects of management practices on grassland birds: Vesper Sparrow. Northern Prairie Wildlife Research Center, Jamestown, ND. Jamestown, ND: Northern Prairie Wildlife Research Center Home Page. http://www.npwrc.usgs.gov/resource/literatr/grasbird/fpvesp/fpvesp.htm (Version 29FEB2000). Jones, S.L. and J.E. Cornely. 2002. Vesper Sparrow (Pooecetes gramineus). In the Birds of North America, No. 624 (A. Poole and F. Gill eds.). The Birds of North America, Inc., Philadelphia, PA.
Herkert, J.R. 1994. Breeding bird communities of midwestern prairie fragments: the effects of prescribed burning and habitat-area. Nat. Areas J. 14: 128–135. Krueger, H.O. 1981. Breeding adaptations of the Vesper Sparrow (Poocetes gramineus) in a fire-altered ecosystem. M.S. thesis, Central Michigan Univ., Mt. Pleasant. Rodenhouse, N.L and L.B. Best. 1983. Breeding ecology of Vesper Sparrow in corn and soybean fields. American Midland Naturalist 110:265–275. Sample, D. and M. Mossman. 1997. Managing Habitat for Grassland Birds: A Guide for Wisconsin. Wisconsin Department of Natural Resources: Madison, WI. Schultz, T.R. 2006. Vesper Sparrow. In Atlas of the Breeding Birds of Wisconsin. (N.J. Cutright, B.R. Harriman, and R.W.Howe, eds.) The Wisconsin Society for Ornithology, Inc. 602pp. Vickery, P.D., M.L. Hunter, Jr., and J.V. Wells. 1999. Effects of fire and herbicide treatment on habitat selection in grassland birds in southern Maine. Pp. 149–159 in Ecology and conservation of grassland birds of the Western Hemisphere (P.D. Vickery and J.R. Herkert, eds.). Stud. Avian Biol. 19.